You are currently browsing the Carpe DMM blog archives for March, 2016. We set no alarm this morning, which resulted in us sleeping in until about 8:30. M. showered and then I went down to get some milk and yoghurt for breakfast. We took it easy preparing for the day, and didn’t leave the room until just after 10:00. While getting the breakfast things, I stopped at the concierge desk to ask if Coit Tower had reopened after the renovations it was undergoing a couple of years ago. He said yes, and when I said I’d been to San Francisco several times but never gone to Coit Tower, he said, “Oh, you have to!” He scribbled on a tourist map the best way to walk up Telegraph Hill, via the relatively gently slope of Lombard Street, and then to go down the hill via the Filbert Street steps, which he said went through some beautiful gardens. It’s been a long day, but fun. This morning we allowed ourselves a sleep in until 08:00, since the first conference talks I wanted to attend didn’t start until 09:10. We did the breakfast routine with Grape Nuts and milk and yoghurt from the hotel cafeteria. Then I went to my talks while M. hung around in the room a bit before leaving to drop off a bag of laundry at Pete’s Cleaners, a place near the Stockton Tunnel which we’d used last time we were here. They charged $15 for a bag wash of everything we’ve worn so far this week. 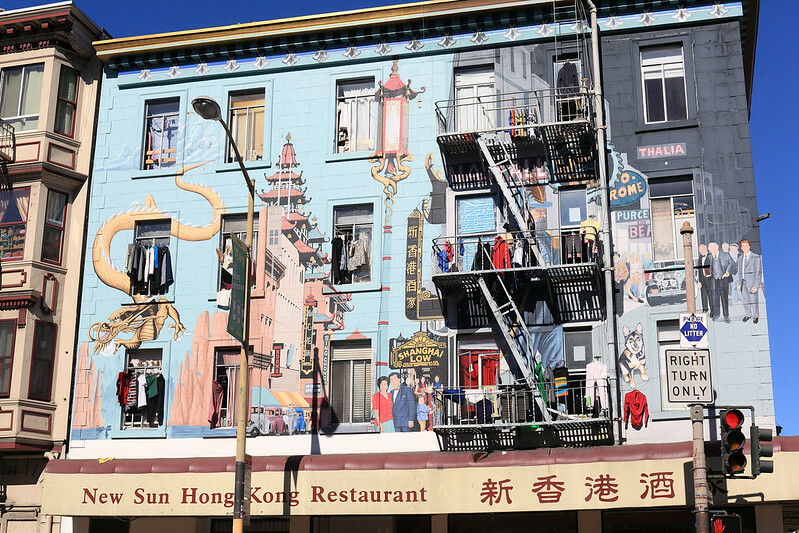 Then she walked down Market Street west towards Hayes Street to explore some of the shops along that street. 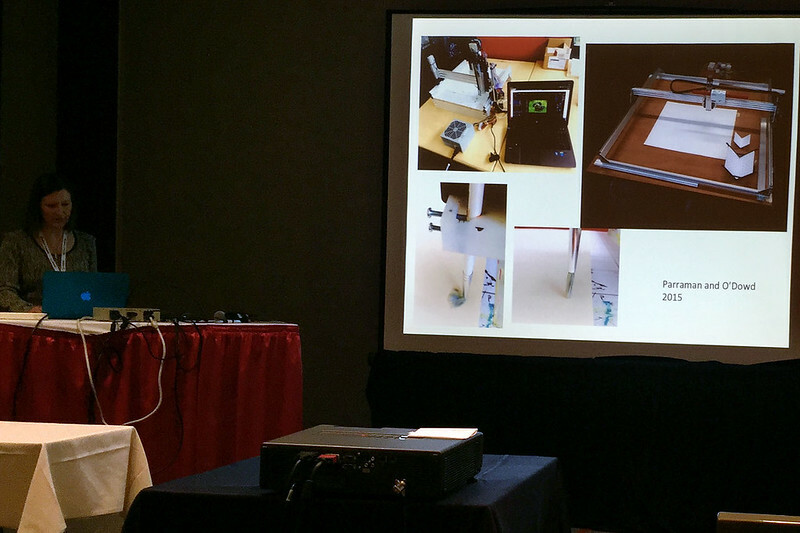 The morning sessions of the conference began with talks on 3D scanning. One was about fixing intermediate depth assignments for pixels on the edges of foreground objects in front of a more distant background. One was generating a deformable 3D model template from video of moving non-rigid objects, such as people or animals. And one was about integrating scans from multiple Microsoft Kinect 3D sensors into a single 3D colour model. After the coffee break I attended another session of the Colour conference, this one about printing. There was a talk about choosing optimal compression algorithms for printing, followed by one about predicting how much toner a page would take to print (apparently not a straightforward problem). Then there was one about dithering of colours in 3D printing, which is much more complicated than in 2D printing, because surfaces can appear at any angle in three dimensions, and the dithering patterns can produce visible moiré effects if they’re not optimised properly for all viewing angles. The last two talks were essentially two parts of one long talk about a project to construct and program a robot to take a given image, then convert the image to a set of brush strokes, then paint it using an actual paintbrush and paints. This was by the same woman who had talked about cadmium red yesterday. The system worked with oil paints and took account of the layering and the textures created by applying paint thickly. It was quite interesting, but I think it has a lot of unfulfilled potential yet, like mixing paint colours on the canvas. 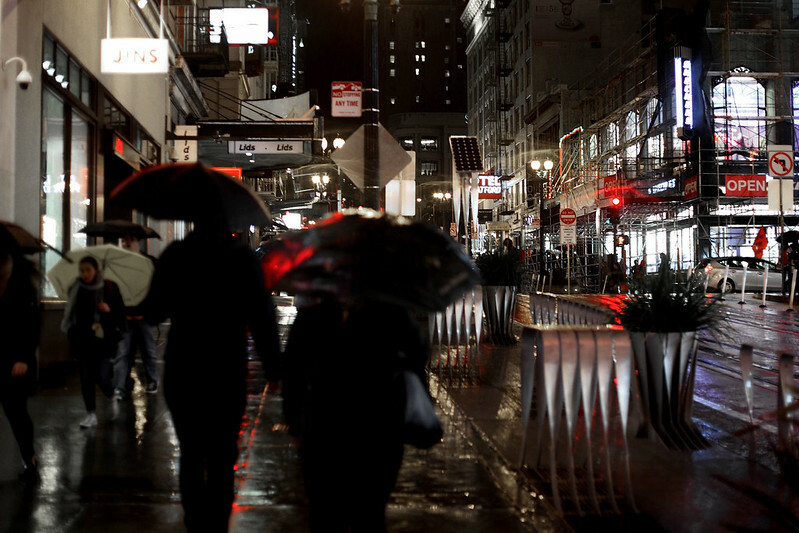 The weather has turned, with San Francisco blessing us with a bit of rainfall this evening. The forecast for today was morning showers, becoming steady rain in the afternoon and possible thunderstorms in the evening. The temperature was to be a slightly chilly 19°C, not too much cooler than the 23s and 24s of the past few days. The morning dawned with a patchy overcast which didn’t look particularly rainy, and indeed the rain held off completely until late afternoon, with a few showers around 17:00, before settling into steady rain only after about 18:00. After breakfast repeating the routine of yesterday, M. went out for a day exploring the Mission across to Castro, then over to Haight-Ashbury, before catching a bus back to the hotel. Her first planned stop was ImagiKnit, a shop Lisa suggested for buying knitting yarn, on the corner of 18th and Sanchez Streets. Here she bought a large ball of fancy multicoloured yarn for her mum to knit a beanie. She got back to the hotel about 15:30, not seeing a drop of rain all day. It definitely rained later in the evening. Meanwhile, I attended day three of the conference. The first Digital Photography talks began at 09:30, so I had time before them to attend a couple of talks in the Stereoscopic Displays and Applications session, which were fairly industry oriented and non researchy talks about applications of 3D displays. Then I moved to the Digital Photography room for a talk on photo editing on mobile phones. The speaker pointed out that some processing algorithms are so computationally intensive that it’s hard to run them on a phone, so people thought cloud computing was the answer – upload your photos, process on a server, and download the result. The problem is uploading a full resolution image and downloading the result takes much longer than running the algorithms! So he proposed a solution where the phone compresses the photo heavily, to a hundredth or less the file size, using low quality JPEG at full resolution, upload that, have the server do a computationally heavy optimisation to produce a processing algorithm “recipe” for the photo based on this compressed version, and download this recipe to the phone for the phone to run on the high quality full resolution image. Although the recipe is optimised for the low quality JPEG, it works fine on the full quality image. This seems like a pretty clever idea to me. The morning rolled along leisurely, as I got up at 7:30 to go down and buy some milk and yoghurt from the lobby cafe. I also got an apple for morning tea, since I’d be having a late lunch. We ate some Grape Nuts and then prepared for the day. M. planned to walk to Cow Hollow, along Grant Avenue to Washington Square and then along Union Street to the shops in Cow Hollow. I, on the other hand, had the second day of the conference. The morning session was about image filtering and denoising, which isn’t particularly exciting for me, but worth knowing about. One paper was the award winning best paper of the Digital Photography conference, which I helped judge, about using genetic programming techniques to develop image filters useful for restoring degraded images. It was a cool paper, and a cool talk, even though it was given by the main author’s Ph.D. supervisor rather than the main author, who had been caught in traffic and didn’t arrive in time! 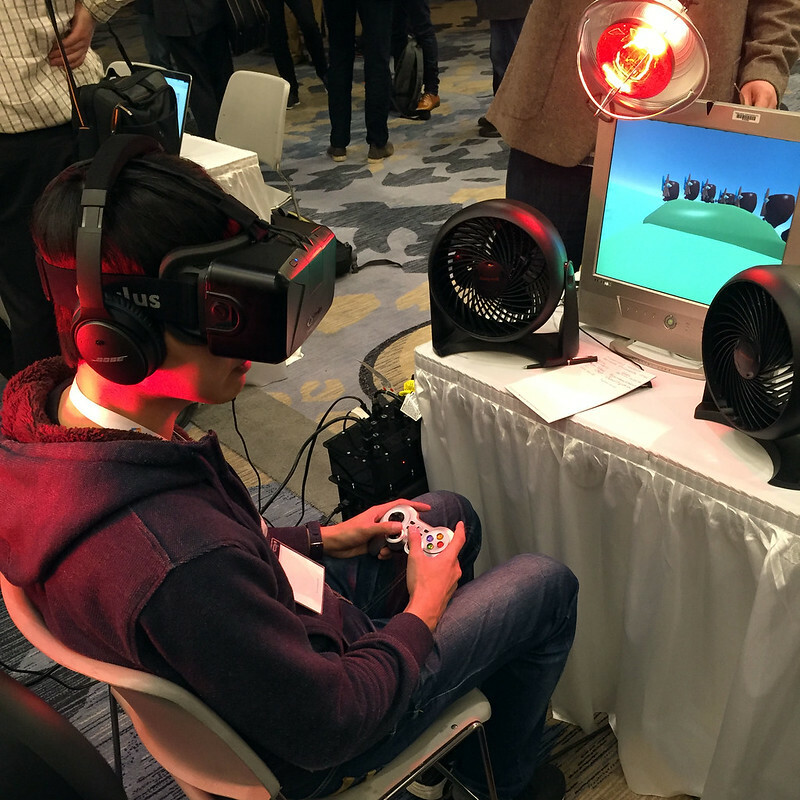 Demo of a computer game with immersive 3D VR graphics via the headset, plus surround fans and heat lamps for wind and heat effects. After the coffee break I attended a session from the Material Modelling and Reproduction of Material Appearance conference. First was an invited talk about imaging refractive objects, that is objects which are transparent and that you can only see because they refract light, like glass. He went into some details of Schleiren imaging, which is a way to make phase changes in light caused by refraction visible, and presented some cool examples of modifying Schleiren imaging to do new things. However, at one point the speaker said, “Ask questions at any time.” This is kind of stepping on the chairperson’s job, and also an invitation for disaster, as was clearly demonstrated when someone interrupted to ask a question about something they didn’t understand, which was explained in great detail two slides ago, thus forcing the speaker to explain it all again, when most of the audience already understood it. Today was the first day of the Electronic Imaging conference. I set the alarm for 07:00 again, to give us time to get some breakfast and then allow me to register for the conference before the first talks began at 08:40. Last night on our way in we’d stopped to look at the cafe in the hotel lobby, and they had a good breakfast selection, including take away cups of yoghurt, fresh fruit, and muesli, so we went down and bought one of those each. It looked like a lot of yoghurt and not enough muesli, so we also got an extra small tub of muesli to share. This was a significantly cheaper and healthier breakfast than yesterday, and tasted good. For tomorrow we’re doing one better, since they sell small tubs of yoghurt and cartons of milk, so we bought a large packet of Grape Nuts cereal from Walgreens to have with those. Previously we thought we couldn’t easily do this as the hotel room has no mini fridge, so we couldn’t keep milk or yoghurt cool. They also have paper bowls and plastic spoons in the cafe, so we’re all set. After breakfast I helped M. sort out the trains she needed to catch to go visit Berkeley during the day, then I went down to attend the conference. Registration was quick, with no queues, and I ran into Nicolas (who used to work with me but left to go to Apple in Cupertino) there. The first batch of talks I attended was in the Image Quality and System Performance conference. There was an interesting talk on developing a single perceptually based measure of image quality which encompassed a range of different image artefacts, such as blurriness, poor exposure, and so on. The presenter said that to calibrate the scale between different artefacts they had volunteer observers judge, for example, how blurry a sample image had to be made until it was equal in “image quality” to a second poorly exposed image. She said at first the observers complained that they couldn’t make a blurry image the same quality as a badly exposed image. So she showed them a nice sharp image and asked if that was better or worse than the badly exposed image. The volunteers said it was better. Then she used a blur slider to make the sharp image really really blurry and asked which was better, the badly exposed image, or the blurry image where you couldn’t see anything. They said the badly exposed image was better. Then she said, “Well, at this sharp end the first image is better than the badly exposed image, but when you blur it out completely then it’s worse. So somewhere in the middle it must be the same!” And after this pep talk the observers could do the task. I’m not entirely convinced that two different image quality axes can be forced to map on to a single axis like this in a consistent way – and indeed she had to throw out three of her observers as their results didn’t agree with the others. After a brief coffee break, the late morning session began, which was the first of Digital Photography and Mobile Imaging conference, for which I am on the organising committee. This was also a joint session with the IQSP conference, and the talks were all about measuring various aspects of image quality: image stabilisation performance, image flare, MTF of ultra wide angle lenses, chromatic flare (or “purple fringing“), and using standardised illuminants to characterise sensors. Following these talks was the lunch for the DPMI conference committee, so I was invited. 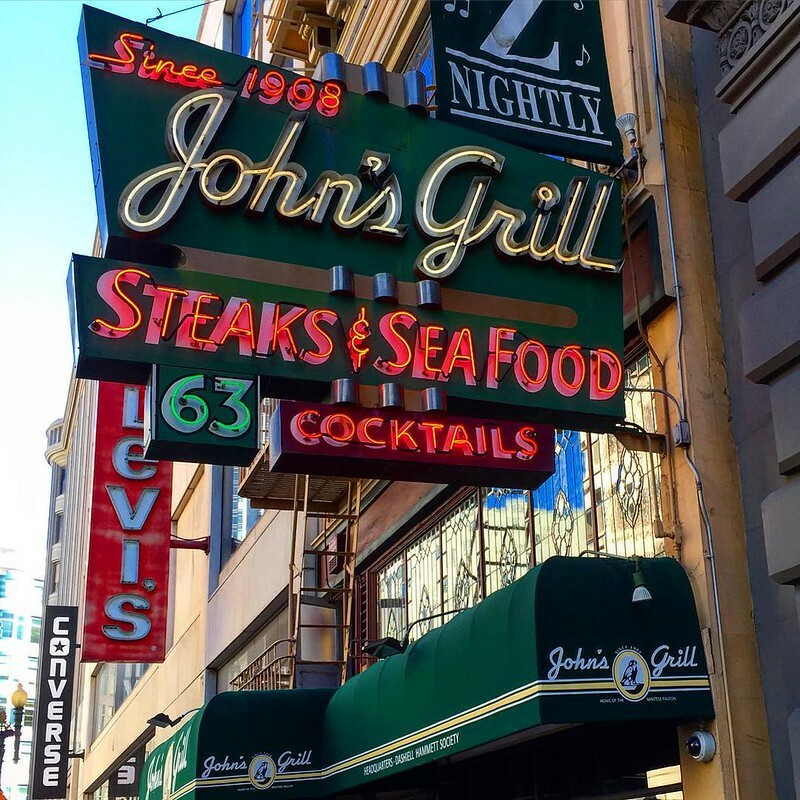 It was held in John’s Grill, a famous San Francisco restaurant which opened in 1908 and was apparently featured as a significant location in the novel The Maltese Falcon (though I’m not sure if it made it into the film). The food was of the steaks and seafood variety, and I chose a broiled salmon, which came with mashed potatoes, broccolini, yellow squash, and hollandaise sauce on the side. Over lunch, the attending committee members, a good 18 or so of us, discussed details for organising next year’s conference, which Jackson Roland from Imatest is going to chair. Read more: conference stuff, followed by dinner in North Beach – pizza! We are sitting on a tour bus in Muir Woods, waiting for the last stragglers to return to our guided tour. We decided to book this tour for today, to get out of the city a bit and see some new things. We got up with the alarm at 07:00, dressed quickly and went for breakfast. Before we left, I phoned the tour operator to confirm our pickup time from the hotel. The website said they were open from 07:00 on Sunday, but there was nobody there and I had to leave a message. 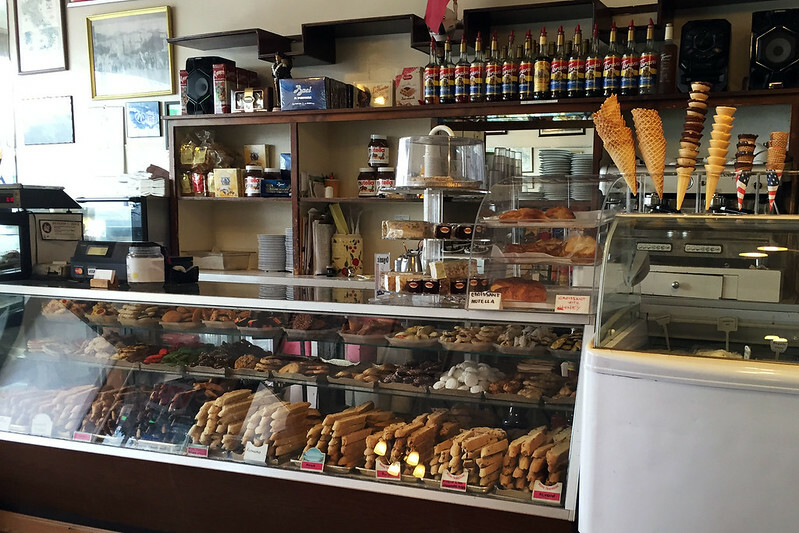 We went for breakfast to Cafe Bellini on Powell Street. This was a very shiny and red place, with all the surfaces either mirrors or dark red. I ordered a breakfast bagel, which had ham, egg, provolone cheese, cream cheese, and tomato. It came with crispy fried chunks of potato on the side. M. had a bowl of muesli with yoghurt and fruit. This, plus M.’s coffee, added up to nearly $30! 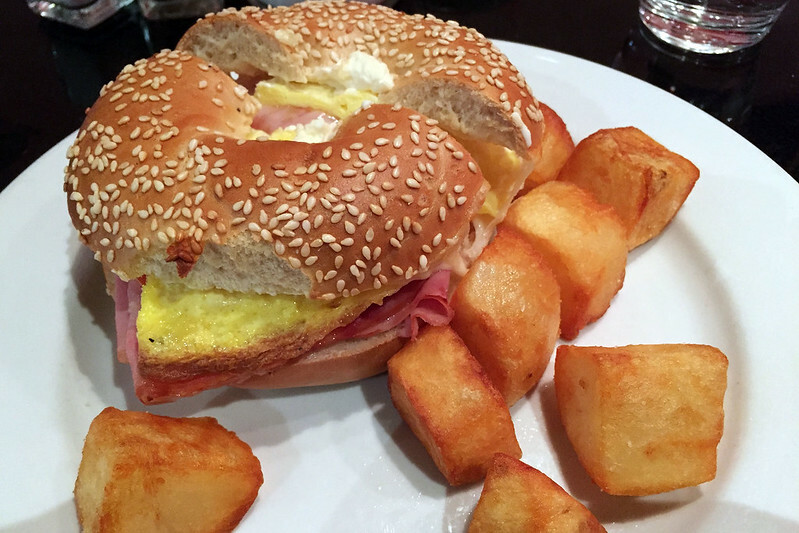 Breakfast bagel at Cafe Bellini. We departed Sydney on a flight at 14:30, arriving in San Francisco around 09:30 on the same day, thanks to crossing the date line. With no checked luggage, our passage through immigration and customs was very fast, as there were no queues of people waiting except at the baggage claim. We caught a BART train from the airport and were at our hotel by about 11:00. After checking in, we immediately left for a brisk walk to keep ourselves awake against jet lag. We walked up Grant Avenue through Chinatown, then across to Powell through North Beach until we arrived at Pier 39. By now it was after midday and we stopped at Boudin Bakery for soup in sourdough bowls, as we did last time we were here. M. had tomato, while I had beef chilli. After the early breakfast on the plane, it was good and filling and hit the spot. We wandered through Pier 39, amazed at how busy it was, probably because it was such a lovely sunny Saturday and there were hordes of tourists around. After browsing a few souvenir shops we stopped to look at the sea lions for a bit, before walking around past Fisherman’s Wharf and to Ghirardelli Square. There we stopped for an afternoon tea, M. having a hot chocolate, while I had a mint bliss sundae, which consisted of mint ice cream, hot chocolate fudge sauce, and whipped cream. It was large and very filling, but delicious. There was a bit of a queue waiting to order at the Ghirardelli cafe, which was a second one in the square, different to the one we visited last time two years ago. As we left, we walked past that one as well – so there are two Ghirardelli chocolate shops and cafes in the square! The queue at this one was enormous, running well outside the shop, so we were glad we’d stopped in the other one.